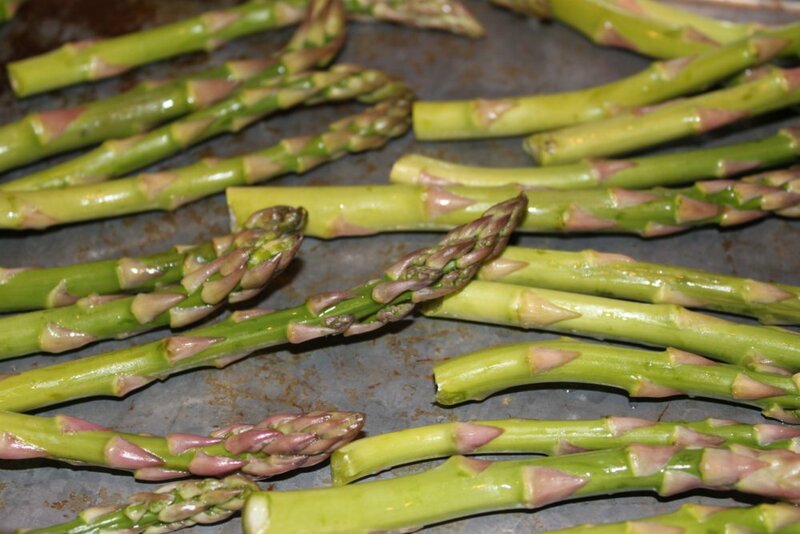 The other day I felt like making asparagus for dinner. 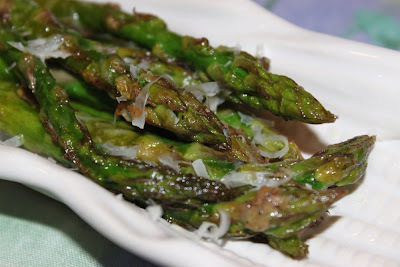 I didn't want just regular steamed (or nuked) asparagus with butter. So I grabbed a roasting pan, turned the oven on, and tossed a few things together. I really like when things are easy and they are tasty. Just a note, for the kiddos, I can cut the spears into bite-size pieces. If you want to start with smaller pieces for the whole batch, go ahead and chop them to size before roasting. Just for fun, I served this on my corn-cob plates. You know, those long, narrow, sculpted porcelain plates that look like corn, designed to hold one cooked ear of corn-on-the-cob? Mine have been gathering dust all winter. (Since there was no corn on the cob to use them with, I got creative.) I think you can find them at Williams Sonoma in the summer. They are one of those cute, seasonal things that you may have to wait until corn season to find. 1 bunch thin asparagus, about 1 lb. 1. Preheat oven to 425F. Wash and dry the asparagus. Break off and discard the woody ends. Place stalks in a 9x13 pan. 2. 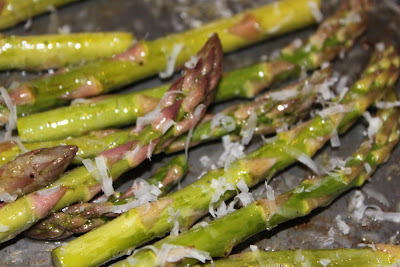 Drizzle olive oil over the asparagus stalks. Season with salt and pepper, then toss to coat evenly. 3. Roast about 10 minutes, or until tender. 4. While still hot, sprinkle the parmesan over all stalks and gently stir. I usually have a block of real Parmeggiano in the fridge so I grate it directly over food with a microplane grater . Or you could buy some already shredded parmesan in a tub and use that. Serve immediately.